Every new technology has the latent potential to disrupt the way things are. But disruption doesn’t just happen: it takes an innovator. Colorado-based startup Mountain Drones is changing the game on risk mitigation and data collection in the mountains. The company’s three founders moved to Colorado in late 2012 to spend time in the mountains skiing with the idea of starting something new and innovative. Brent Holbrook, CEO, had spent his childhood building drones before they were cool; Warren Linde was a financial services expert who had taken a sabbatical in Telluride, Colorado; CTO Robert Blank spent his early career teaching himself database architecture design. The three knew they wanted to unite their passions for the mountains, skiing, and technology. One day Warren came to their weekly entrepreneurial working group with an idea: to equip drones with avalanche beacons to more quickly find and mark buried victims after a slide. 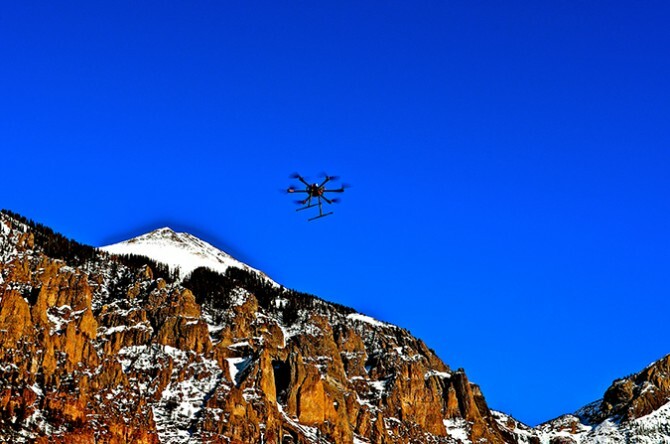 Mountain Drones testing technology in Bear Creek, near Telluride, Colo. Excited but wisely cautious, the entrepreneurs knew they had to validate their assumptions with cold, hard fact before sinking any resources into an effort. So they got on the phone with dozens of ski patrol units around the country, pitching their idea and gauging its viability as a business. For the first of many times to come, the answer: “No.” Sure, a drone might pinpoint a victim’s location quickly, but dogs make for stiff (and cheap) competition for locating buried victims. Besides, either method still requires a group of rescuers to actually dig the buried person out; using drones would not be worth the cost of development and deployment. Brent, Robert and Warren went back to the drawing board. Ever innovating, the trio drove into the heart of the problem. What if they could prevent the need to dig people out in the first place? That is, how could they use drones to keep ski patrol safe while still effectively mitigating the avalanche problem itself? Anyone who has taken an AIARE course knows: avalanche hazard is incredibly high, especially on certain slopes, immediately following a big snow event. Give the mountains a few days and the snowpack may stabilize; slopes prone to slide will naturally slide and a delicate equilibrium is (more or less) restored (to be sure – danger still exists. But avalanche risk decreases dramatically as time passes after a big storm adds load to the existing snowpack). Humans have studied the tendencies of the mountains enough to identify where these avalanche “start zones” lie – ski patrollers the world over are tasked with the challenge of safely climbing the ridge and lobbing bombs onto the slope to trigger slides and stabilize the terrain, either inbounds or above key economic conduits like roads, railways or oil pipelines. For those areas unreachable by humans, costly helicopter missions and outdated WWII howitzer cannons are used to trigger avalanches before they cause property damage or endanger lives. The entrepreneurs asked themselves: couldn’t this risk to human life be all but eliminated by flying a drone to the start zone and deploying an explosive charge? Back to the phone lines, they started getting their first affirmations: ski resorts, transportation officials, even some international organizations expressed serious interest in the service they were describing. In the startup world, this is called “traction”, and is one of the key characteristics investors look for in a fledgling business – some indication by the markets that the product being created is worth money. The team had found their “product-market fit” in an emerging industry projected to reach upwards of $120B by 2024. Just as these first “yes’s” were rolling in, Mountain Drones was applying to a startup incubator in Telluride, Colorado called the Telluride Venture Accelerator (TVA). The six-month program is intended to hone the portfolio company’s business models and connect them with key mentors and investors, giving the founders a much greater chance of success in our increasingly-competitive global business environment. Mountain Drones’ focus on an emerging technology and the traction they were gaining won them acceptance into the program – they moved down to the perfect setting to build a business based on assessing risk in the mountains. The TVA pushed the group to look bigger: what tech could they develop that would serve a larger market? 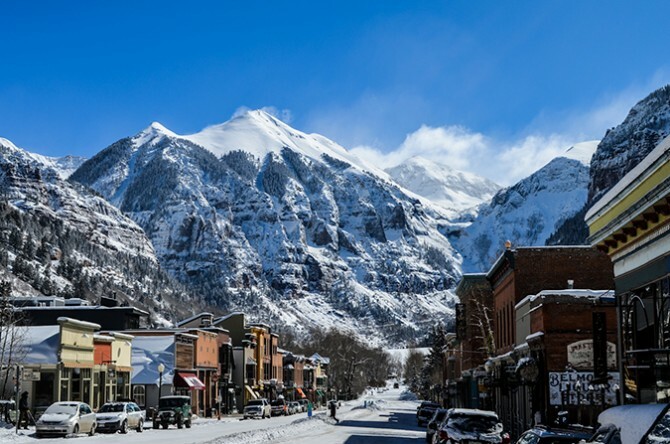 They were encouraged to stay true to their initial focus of drones and snow, but the expert mentorship in Telluride suspected that there were much broader – and more profitable – applications of their technology than the few resorts and transportation departments that would want to purchase their services for avalanche mitigation. The mountain winter wilderness is one of the most inhospitable and inaccessible environments on the planet. Very little is known about the mountains in the winter months: what is the nature and condition of the snowpack? How stable is it? How much water does it contain? When will that snow melt into running water? Through heavy engagement with industry professionals, the team was encouraged to reach out to a well-known international snow science researcher and associate professor at Boise State University by the name of Dr. Hans-Peter Marshall. Dr. Marshall is a Geophysics and Remote Sensing researcher specializing in snowpack stability modeling. Most notably, the professor has researched a great deal into using remote sensing tools, especially a technique called “Frequency-Modulated Continuous Wave Radar,” or FMCW radar, to measure and analyze snowpack characteristics. Very simply, a FMCW radar transceiver passing over the snow emits a radar signal that varies in frequency over a fixed period of time. By measuring how long it takes for these varying frequencies to bounce off of the ground and reflect back to the transceiver, the distance to the ground can be determined. Done correctly, an accurate image of ground surface shape can be calculated. Dr. Marshall’s breakthrough, though, was in using FMCW radar data to determine the characteristics of the snowpack from the surface to the ground. Unlike LiDAR, another way of accurately measuring a surface, the signal emitted by the FMCW radar unit both penetrates and is reflected by the snow layers. That is to say, Dr. Marshall used this technology to look into the snowpack, and take a picture of its characteristics at different depths. Specifically, he could calculate (with a great deal of accuracy) the density of each layer, then deduce the “Snow Water Equivalent” (SWE), or the amount of liquid water that would be left if a certain area of snow were melted down. Trivial as it may sound, the implications of this technology could be massive. A sample chart made from Dr. Marshall’s FMCW readings. Snow depth and snow density are represented, providing researchers information to model snowpack stability. When they learned about this, the Mountain Drones guys were gobsmacked. If they could mount one of these FMCW radar units on their drones they could cheaply gather huge amounts of data about snowpack conditions of any mountain range in the world. The team had learned of Dr. Marshall’s success with the sensor placed in fixed locations and on helicopters – to get accurate readings, however, the research team had to fly at extremely low altitudes, putting the pilot, crew and equipment at risk. Due to technological advancement the FMCW units have been getting smaller and smaller – light enough to mount on a drone. CTO Robert Blank with a drone designed for larger payloads. Scanning a mountain landscape by drone with FMCW radar would inexpensively provide Mountain Drones with data about the depth and density of the snowpack. This information, in the right hands, would be hugely valuable. Around 80% of water consumed in the Western United States comes from snowmelt; providing accurate and comprehensive information on the state of a region’s snowpack could enable hydrologists to more sensibly plan water use – impacts reach beyond residential consumers into agriculture, food and beverage production, fire mitigation, and beyond. As our understanding of how snowpack acts over time, we can build computer models that will more accurately be able to predict water resource based on more complete and frequent data. The team plans to use this technology to strengthen existing snowpack and hydrology models to gain a much more accurate understanding of snowpack over larger geographical areas. Mountain Drones has even been contacted by relief agencies in the third world, who want the experts to deploy their technology to serve as an early warning system for towns typically prone to detrimental floods and avalanches, potentially saving the residents weeks of unnecessary evacuation. Mountain Drones‘ new technology could definitely help humanity manage the environment while mitigating human suffering, surely making it one startup to keep an eye. A “Digital Elevation Model” created using aerial drone data.